Yikes!! 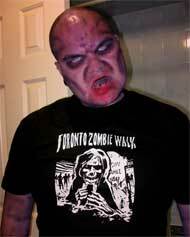 Only 4 months to go before the dead rise and invade the streets of Toronto!!! Yes boys & girls, the official Toronto Zombie Walk is back for 2010. Mark your calendars for Saturday, October 23. It's going to be bigger and better than ever. Will we break last year's attendance estimate of 5,000 undead souls? Come on out and count heads for yourself. We have some new things this year, including FREE Toe Tag registration. Now, you're probably saying to yourself, "I've never had to register before. What gives?" Or, maybe you're standing there shaking your fist saying, "F*** you. You'll never take me alive (undead?)!" Indeed. In either case, why should you register for this tremendous grassroots success? Well, success brings new challenges. And this is one way that we can get some stats so we can go for bigger events... As the undead Martha Stewart would say, between bites of brain tartar, "It's a ghoul thing." And, did I mention there are tasty incentives to registering? Yep. We're going quid pro quo, baby. You register either in advance on-line, or on the day at the TZW starting point with one of several TZW Registration Volunteers with clipboards. Trust me, It's better to register in advance and avoid the line-ups and hassle of a last minute rush. When you register on-line you'll receive an e-mail with a registration number. Print out the registration e-mail and bring it to the TZW starting point and trade it for your very own keepsake, commemorative TZW TOE TAG. The Franklin Mint ain't got squat on this baby. Each TZW Toe Tag is numbered and eligible for special prize draws. Flashing your souvenir TZW Toe Tag also gives you the special Zombie Discount at the Bloor Theatre screening following the TZW. Fortunately, some amazingly generous sponsors have donated a number of fiendtastic prizes. And we've created some awesome prize packs that YOU CAN WIN when you help out The Toronto Zombie Walk. Brain Drive Tickets are available for a donation of $5, or 3 for $10! We also have a ghoulishly amazing MYSTERY PRIZE - you get a chance at that one for a donation of $2. To check out the prize pack contents click TZW Brain Drive You can Enter/Donate securely through PayPal. *merch from Crypt Club Productions Inc.
Then, on July 31, 2010 we'll choose random donors to each win one of our seven awesome prize packs. The more you donate to the TZW, the better your chances to take home some sweet swag! We will be announcing other BRAIN DRIVE events shortly, so keep your eyeballs peeled!!! We are always looking for prize donations for future fiendraising raffles and as giveaways on TZW day events. We are very GRAVE~ful for all your help and support!